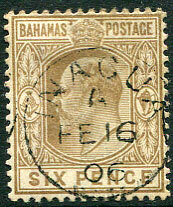 (T.1) the latest recorded date of A/FE 16 06 on KE7 6d brown CA wmk (SG.66, Cat.£35). Only 5 days unaccounted before earliest date T.7 1 INAGUA dated 22 FEB 06 known on KE7 2½d (SG.73). (T.1) C/26 OC 6 (LRD) on KE7 1d (SG.72). 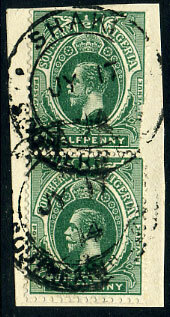 (R.13A) 28 OC 13 (LRD) on 3 x KGV 1d (SG.46) piece. 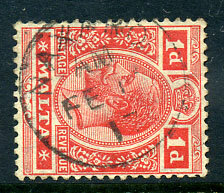 (T.7A) JY 17 14 (LRD) on vertical pair ex booklet KGV ½d (SG.45) piece, top stamp with defective edge. 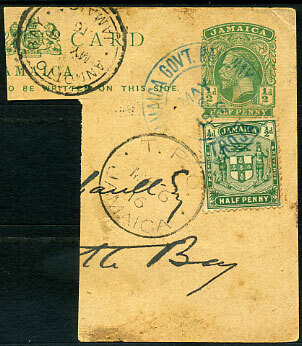 (030.01) (JU)L 19 12 (LRD) on KGV 1d (SG.113), extremely rare on KGV issues. 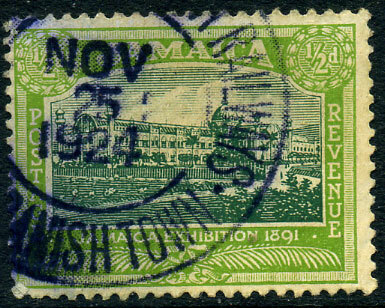 (T.1a) C/NO 29 94 (LRD in purple ink) on QV 2½d. (T.1) A/FE (28?) 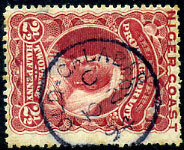 -- (LRD) on KE7 2½d (SG.63), small facial scuff at top. 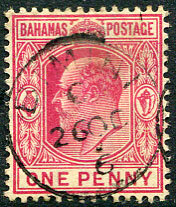 (027.00, 24mm, tall letters) */AP 2 25 (ERD) on block of six KGV 1d (SG.132), top left stamp with corner facial fault. Evidently short-lived and the finest (by far) of the two dates recorded. Office opened 10th March 1925. ERD for Commendi (027.01, 24mm, broader letters) is */22 MY 25. 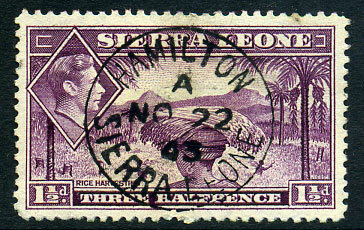 Illustrated Page 15 (as a block of 4 to get a single impression from this block of 6) of "The Postmarks of Sierra Leone 1854-1961 Second Edition" by Walton, Quirk, Hamilton, Horry. 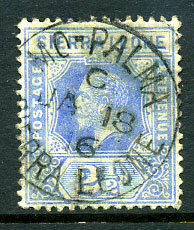 (049.02) A/NO 22 43 (LRD of cds and "A" code) on KG6 1½d (SG.190a), exceptionally rare on KG6 adhesives due scarce office and short life. 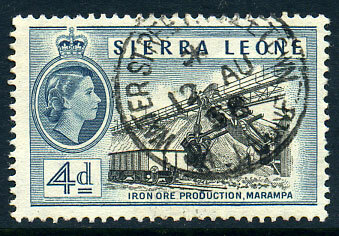 Illustrated Page 42 of "The Postmarks of Sierra Leone 1854-1961 Second Edition" by Walton, Quirk, Hamilton, Horry. (035.93) */12 AU 58 (LRD) on QE2 4d (SG.215). 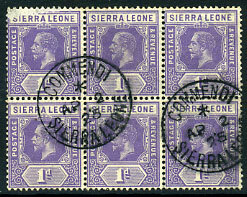 (T.2) s/ways up C/NO 1 02 (LRD violet ink, scarcer second band of use) on KE7 ½d (SG.38). 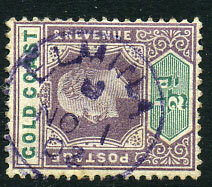 Two periods violet ink recorded AP 17 02 to JY 14 02 and OC 15 02 to NO 1 02, all examples are with sideways up "C" code. 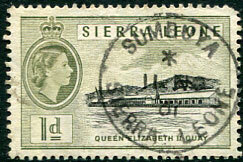 (115.02) C/JA 18 16 (LRD) on KGV 2½d (SG.116). 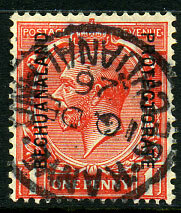 (1B1) 10 DE 26 (LRD) on GB ovp'd KGV 1d (SG.92).